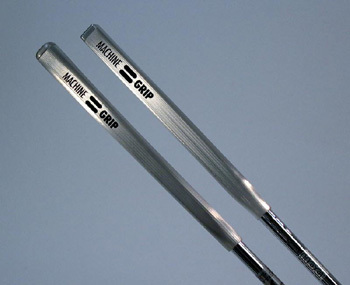 The revolutionary new MACHINE GRIP, the first ever CNC milled, aerospace metal alloy golf grip providing dramatically improved feel, precision, quality and durability – and it looks great too. The MACHINE GRIP represents quantum leaps in manufacturing precision, assembly precision, quality, feel and customization. Players can now get the same precision, quality and performance in their grips as they have come to expect and enjoy in their CNC milled putter heads. MG-1: very square v-shaped grip with a pistol and very flat top. MG-3: a traditional oval-shaped grip with arched pistol shape and flat top. Also, a revolutionary new shape will be announced here soon, so stay tuned! Each of the above are currently available in aerospace aluminum alloy that can be anodized in blue, red or silver, or plated e-nickel for a rich platinum look.